Mahtomedi senior Charlie Bartholomew doesn’t have the supernatural ability to predict the future. But when he passes the puck to sophomore Nicolai Dulak in prime scoring position, Bartholomew is pretty confident he knows what will happen next. “I saw the look in his eye and thought, ‘He’s not going to miss this,’ ” Bartholomew said after Dulak scored in overtime to lift the No. 1-seeded Zephyrs past No. 5 Northfield 3-2 on Monday in a Class 1A, Section 4 semifinal at the Roseville Skating Center. Get the puck to Dulak. Sounds easy enough. But avoiding what would have been one of the biggest upsets of this season’s playoffs was a monumental struggle for the Zephyrs (20-6-1), who are ranked No. 2 in Class 2A in the latest state coaches’ poll. Mahtomedi, the state’s sixth-most penalized team during the regular season (323 penalty minutes in 25 games), was whistled for seven penalties against the Raiders (19-6-2) on Monday. One of them was a 5-minute boarding call on Noah Skillings. Amazingly, the Zephyrs’ didn’t allow a power-play goal. At one point late in the third period, with Mahtomedi trailing 2-1 and killing yet another penalty, Poeschel figured it was going to take a shorthanded goal to force overtime. Mahtomedi’s aggressive penalty killing, combined with Northfield’s short bench, eventually led to the Raiders running out of gas. Mahtomedi outshot No. 17-1A Northfield 21-7 in the third period, getting the tying goal when Bartholomew banged a rebound into an open net with 3:31 remaining in regulation. “We got a little bit panicky with the puck,” Northfield coach Mike Luckraft said. “We chased a lot of pucks, and it made us tired. Goals 17 seconds apart by Devon Jirik and Carson Van Zulilen put Northfield ahead 2-1 early in the second period. A brilliant third period by Northfield goaltender Wesley Lideen (he made 20 of his 44 saves), wasn’t good enough to prevent Bartholomew from scoring and forcing the overtime period. From there, Bartholomew knew just what to do. Get the puck to Dulak. Sophomore Nikolai Dulak scored 4 minutes, 23 seconds into overtime to lift No. 1 seed Mahtomedi to a 3-2 victory over No. 5 seed Northfield on Tuesday in a Class 1A, Section 4 semifinal at the Roseville Skating Center in Roseville. 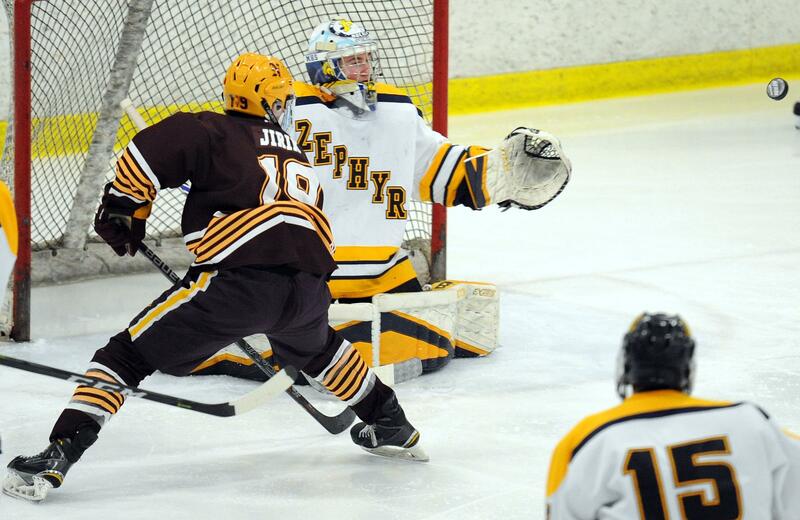 Dulak took a feed from senior Charlie Bartholomew and fired a hard shot just under the crossbar as the Zephyrs (20-6-1), who trailed for most of the final two periods, avoided the upset. Mahtomedi, ranked No. 2 in the Class 1A coaches' poll, advances to Friday’s section championship game against either Simley or South St. Paul at the Roseville Skating Center. Bartholomew forced the extra period when he scored on a power play with 3:31 left in the third period. Northfield’s Devon Jirik and Carson Van Zulien scored 17 seconds apart early in the second period to give the Raiders (19-6-2) a 2-1 lead. Mahtomedi won despite being whistled for seven penalties, including a 5-minute major for boarding on Noah Skillings in the second period. No. 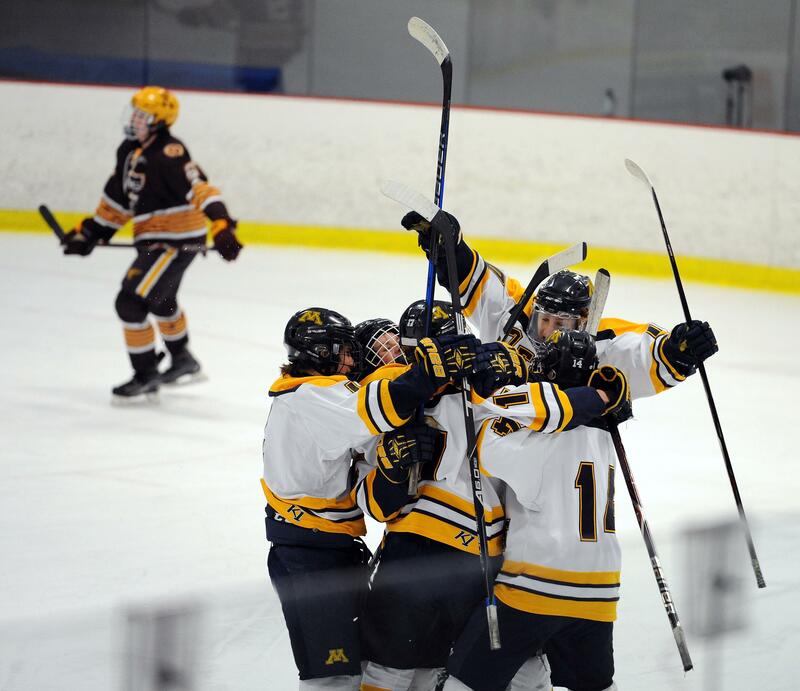 17-1A Northfield went 0-for-7 on the power play and Mahtomedi scored on two of its four power plays. Northfield goaltender Wesley Lideen made 44 saves, including 20 in the second period. Mahtomedi’s Bailey Huber finished with 28 saves.